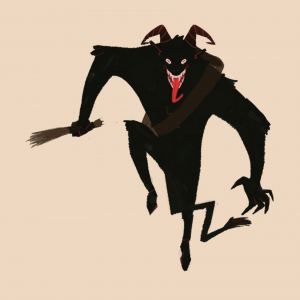 Ya’ll know about Krampus, right? I mean, there was a movie, and everything. He’s basically the anti-Santa. He doesn’t give out coal the bad children. He whips them with sticks. Yeah, that was the original Christmas tradition. Getting whipped with sticks by a demon that was friends with the jolly fat man. Friends? Mutual beneficiaries? I dunno, either way, it’s scary as hell. Some REAL motivation to be nice through the year. Wrap this cloth around your torso to commemorate the horror that must have been left over from Halloween.